In my day to day, I carry a pen and a Sharpie marker. I don’t remember when I started doing this but as soon as I wake up in the morning and get my day started at the shop, I always put those two things my my left pocket. I feel weird not having them and they really make up the core of my EDC items. 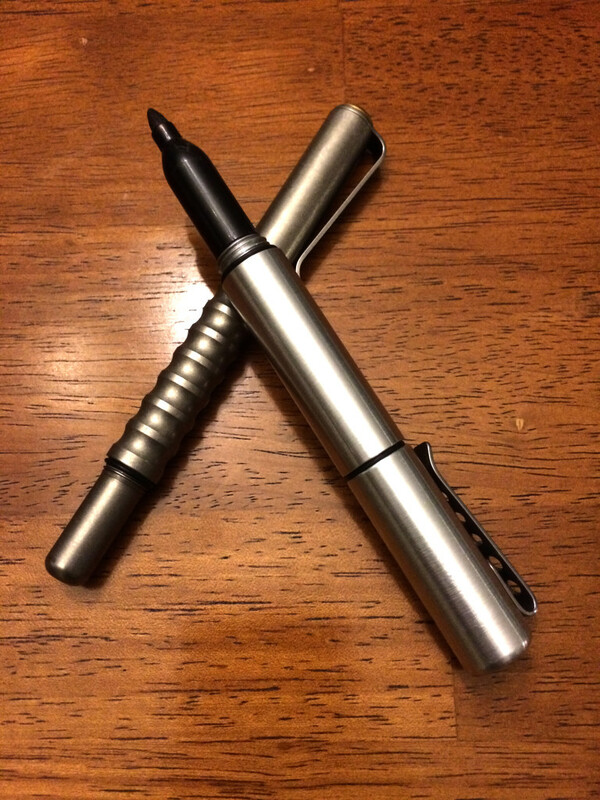 My most recent acquisition is the beautifully made titanium version of Jason Hui’s Alpha pen, which was a successfully funded Kickstarter project. Jason’s an insanely crafty guy, designing and manufacturing flashlights under his moniker, Darksucks. 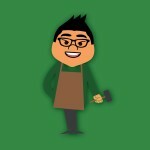 His low volume, high quality produces ooze style and class for the discerning gear guy/girl. His Alpha pen uses the finest of refills, the Mont Blanc felt tipped fine liner. At $4-5 each, the pen matches the pricey and beautifully writing capabilities of the refill. 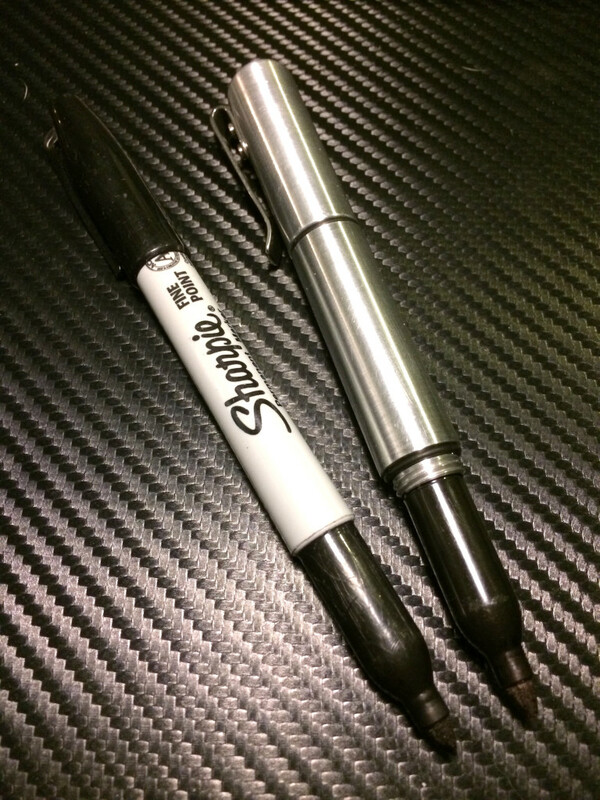 Having a medium size collection of higher end custom pens, one of my greatest wishes was for someone to make a beautiful Sharpie marker holder. I’ve been waiting for someone on Kickstarter or other crowdfunding platform to make one, but no one seems to want to take up the challenge. 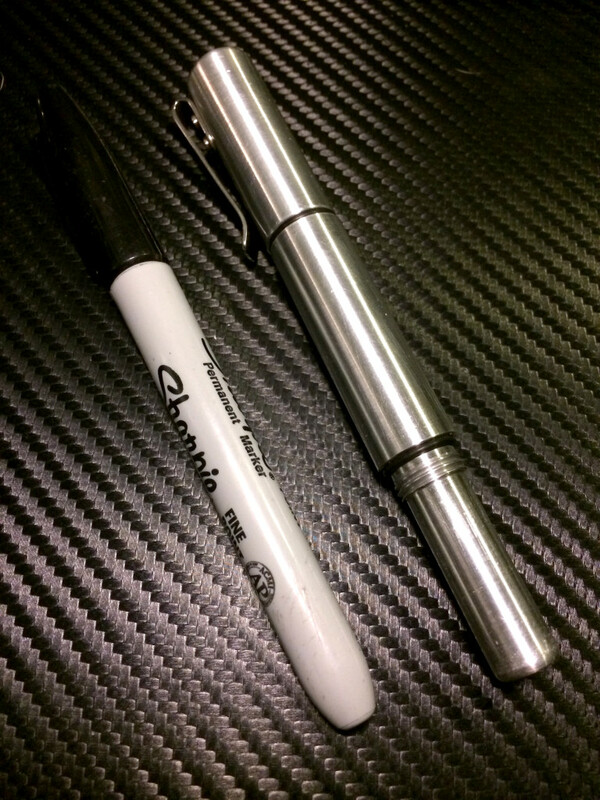 Sharpie does make a stainless steel marker but the design leaves so much to desire and the refilled are fairly expensive given the relative short lifespan of a marker. I finally broke down and spent some time in front of my lathe and made one. 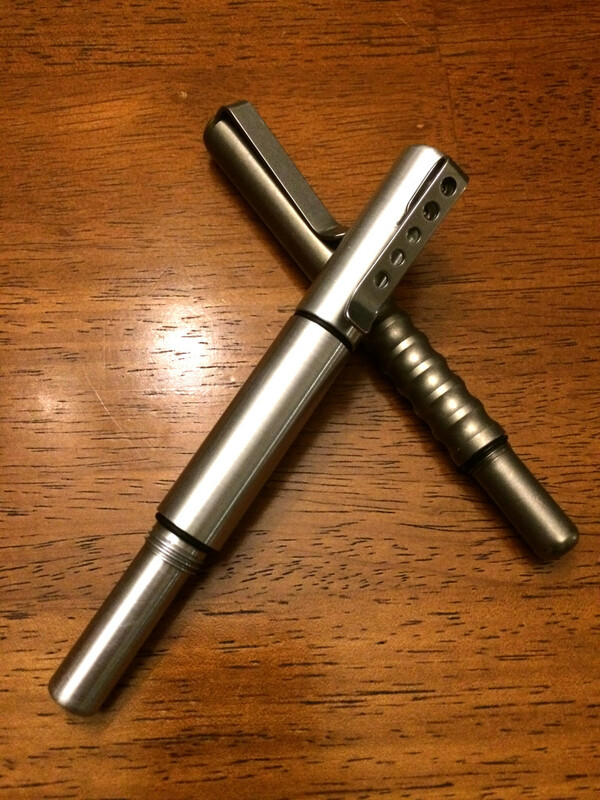 This is turned entirely from 5/8″, 6160 aluminum bar stock and using very commonly sized imperial HSS drill bits. The clip is from a Sanrenmu knife that seats itself into a flat spot milled into the face of the cap. Basically, it’s a sleeve that accepts the grip, tip and ink well sponge of a regular sized Sharpie fine tipped marker. Extracting this is pretty easy, just bend the plastic body of the maker till the body separates from the grip. Then slide it into the Delta body and press down with the plastic cap. This seats the “refill” fully into the new home. I call it the Delta Marker. 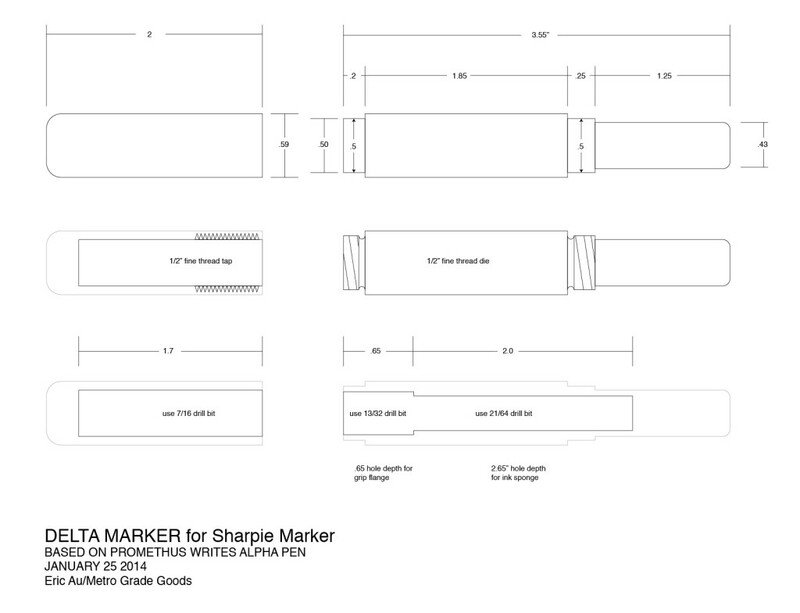 Well, it’s no match for The Alpha pen, and it’s not refined enough to be a Beta so, it’s the Delta marker. It is also based off of Jason’s design, using his cap posting design ad well as the capping design, so it’s only natural to follow his naming convention. The only thing missing is the shallow scallops on the body, to do this I would need a round insert holder, which I broke some time ago. I also wanted it to seal, so I added a groove at the base of each 1/2 fine thread for an o-ring. 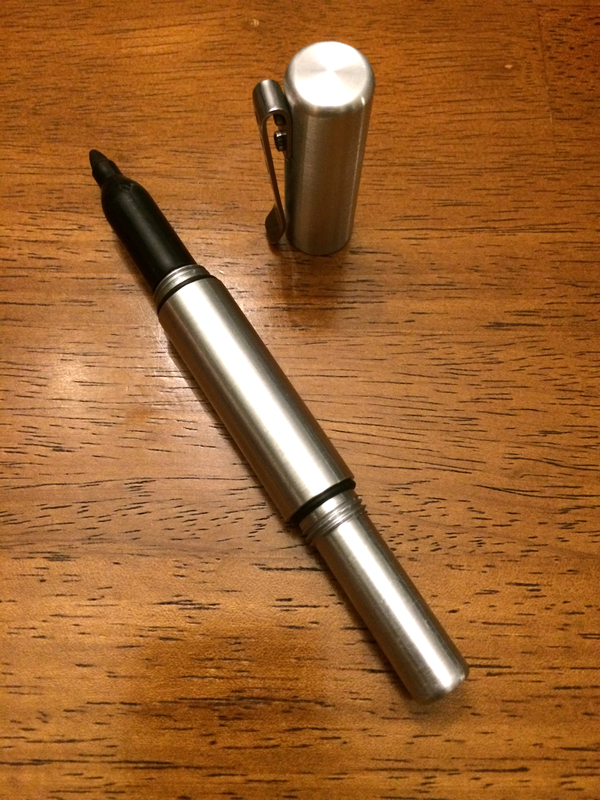 This did two things, it won’t allow the nib from drying out, but it also engages the cap when torqued on a bit so it won’t accidentally come apart in my pants or shirt pocket. 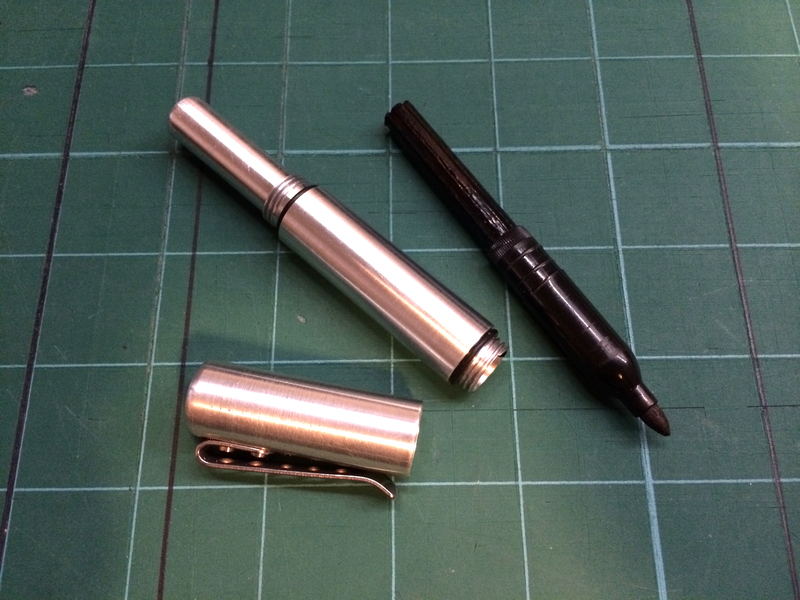 I actually came about this epiphany when the Alpha pen came apart in my pocket a few times, so I put a few, really small o-rings meant for a AAA flashlight seated at the base of each thread. Lucky for me, Jason designed a relief for the threads, which meant there was a groove for the o-rings to seat. Mine are much less precise, but they don’t need to be since the o-rings I used are much thicker to generate a better seal. Just a quick note, these are not for sale, it was a personal challenge and this blog is a place for me to present final, in progress, experimental as well as failed projects. It’s not often something comes together so nicely on the first try, but thanks to Jason’s design, a lot of the guess work is done for me. Here are some table top shots, under the Delta Marker is the Alpha pen. Thanks for making it all the way to end of another long winded, designer rage fuelled build. 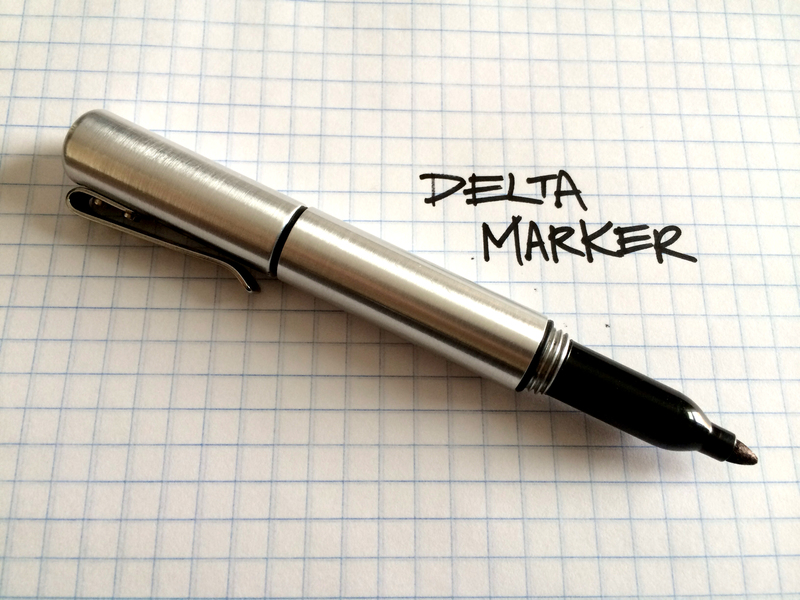 I am really happy with the Delta Marker and it will serve me well until I can get this design in CAD and possible CNC this. That is a stunning piece, well crafted. Thanks for sharing it.